Join the Carolina Theatre for an afternoon of song, provided by YOU! 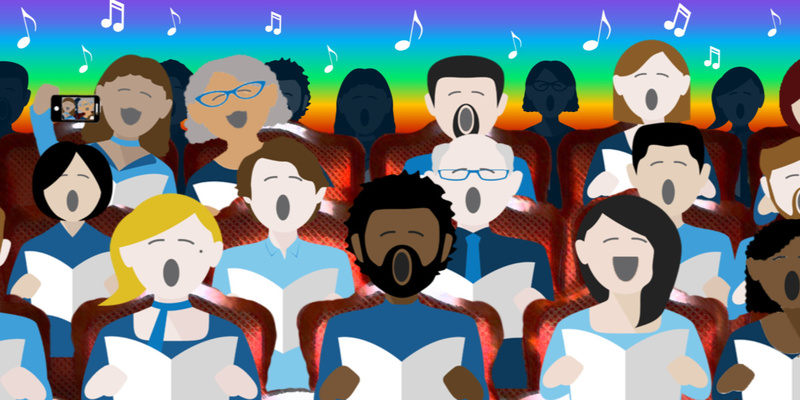 This FREE community event invites singers and lovers of song at every skill level and ability imaginable to gather at the Carolina Theatre for an afternoon of musical commUNITY celebration. This CommUnity Sings will feature more than 1,000 voices singing three songs (plus two warm-ups)! Doors will open at 2PM. Pre-show provided by the UNCG Spartones and Gate City Ramblers! Singing will begin at 3PM. We’ll learn the songs (with some help from the pros! ), and then we’ll raise our voices. Special thanks to our Musical Director, Wesley McCleary-Small, and to accompanist Christy Wisuthseriwong. Gather your family, call your friends, get the band back together, and then join the commUNITY! THIS EVENT IS FREE AND OPEN TO THE PUBLIC! No tickets are necessary. (The concessions stand will be open for those who wish to purchase snacks.) We hope to fill the theatre, so please plan to arrive early. First come, first served. The core mission of This CommUnity Sings is to foster a sense of unity, harmony, oneness, cooperation and connectivity throughout Greensboro and Guilford County. By bringing together all the myriad elements of our community to create a harmonious whole, our hope is that this simple act will create a ripple effect that will spread not only throughout Our Town but also to other communities. Using the universal language of music, we believe that this community sing-along will raise awareness that we are, indeed, one people and will inspire others to understand that there is strength through diversity.